Saturday is St. Patrick’s Day, and as has become a bit of a tradition on this site, we set our sights on showcasing the best jerseys in the league based on colour. Green was where it all started, then we did gold (because all good leprechauns are looking for gold), and this year we’re doing black. Why black? 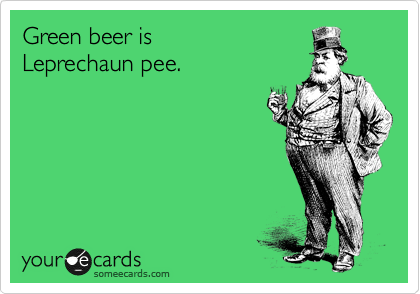 Well, if you’re not drinking green piss water beer on Saturday, there’s a good chance you’ll be drinking Ireland’s most famous export: Guinness. A beer that’s as black and delicious as they come (don’t @ me). There’s always been plethora of black jerseys out there, and a good chunk of them are horrible. Black became the de facto “I look scary and intimidating” jersey for awhile, even though some very non-scary, non-intimidating, awful teams wore black jerseys. And those Black Ice jerseys were the truly awful endgame to all that garbage. But some teams have done a good job balancing the mono-chromaticism of black with the right enough of contrast to make it work, making it as enjoyable as a pint of Ireland’s finest stout. Here’s the top five. Okay, the top six. 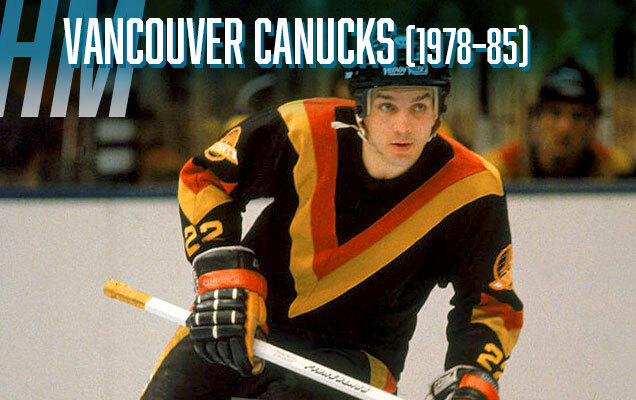 We’ll give an Honourable Mention to a Canucks jersey that, despite its almost universal hatred, continues to buck every single trend in hockey jerseys and creating the most distinctive and unique jersey in all of hockey. Yes, it’s odd, but that’s the only reason it remains so reviled. From a design standpoint, the simplicity of it is really stunning. 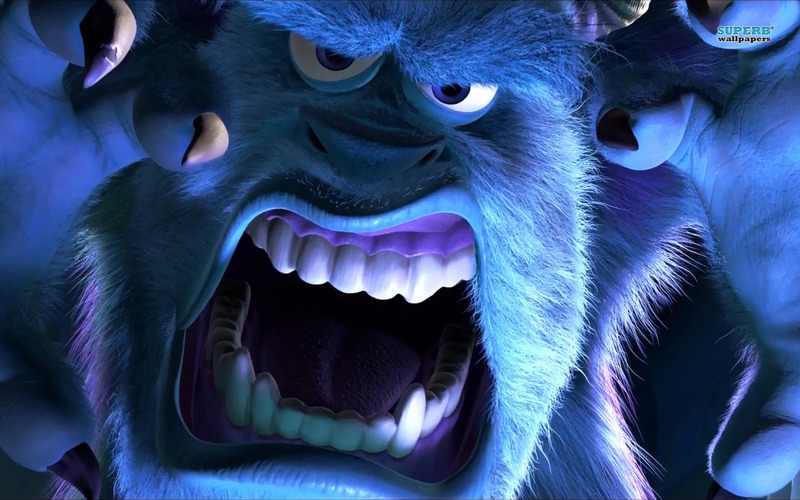 You have strength, you have movement, you have aggressiveness. 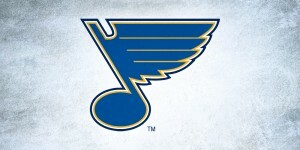 Not many teams – before or after – have moved their main logo to the arms to make way for what’s essentially a design element, and getting teams (or any company for that matter) to break the mold and try something completely new is never an easy task. While it’s far from being a perfect jersey, or the best black jersey in the history of the league, but it’s unique and creative enough to get it onto this list. 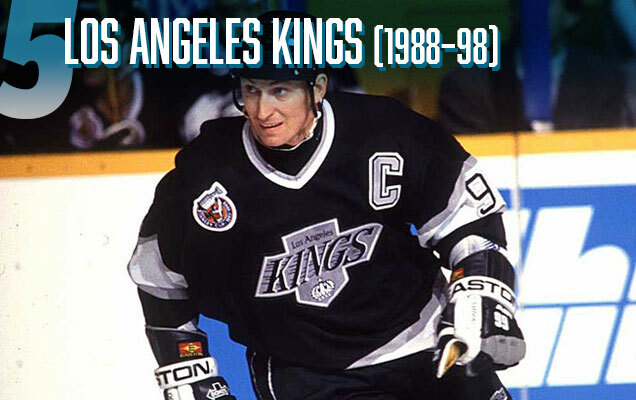 We officially start off the Top 5 with possibly the most monochromatic black jersey of them all: the Gretzky-era Kings. The only colour anywhere on the jersey is from League-mandated patches (like the Stanley Cup patch in the above image), and it takes a certain chutzpah to pull that off. What helps is the liberal use of silver throughout and the wide white stripes on the sleeves and jersey bottoms to create some much needed contrast and break from the onslaught of black. And with that, it ends of being a quite simple and elegant jersey: black not for the sake of being black, but as an exercise in unique visual branding. The current Kings jerseys could sitting here too, but damn, is that logo ever awful. 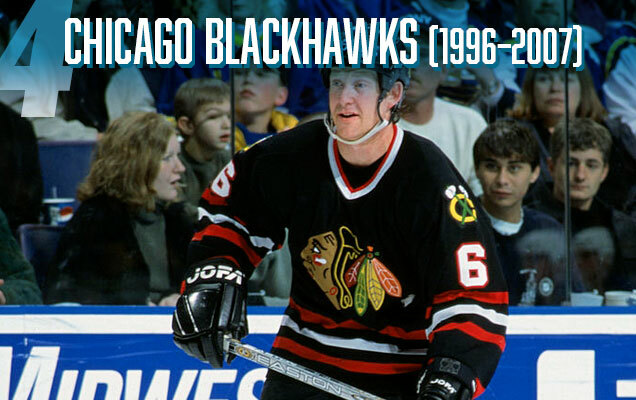 When you think Blackhawks, you don’t generally think of black jerseys, especially given that their home reds are considered among the pinnacle of hockey jerseys bar none. 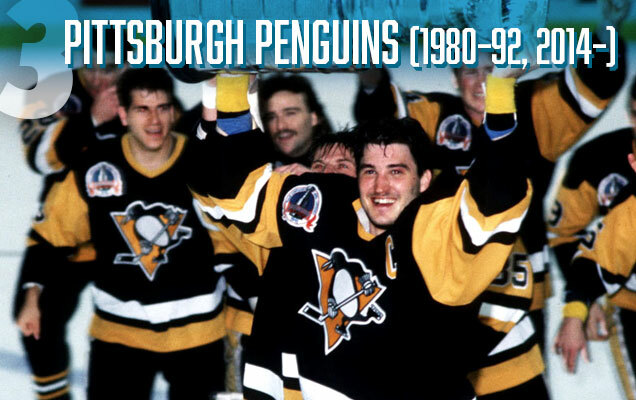 But there was a period when they featured a third jersey in black. While this jersey is obviously inferior to the regular home-and-aways, that’s a high bar and these black ones are among the best that plagued the NHL in the ’90s-’00s. The simple red and white stripes, along with the traditional multi-coloured Blackhawks logo crest and shoulder patches break up all that mono-chromaticism to make a striking and mostly-balanced jersey. It might’ve looked a little better with shoulder yokes of some kind, as they’re pretty bottom-heavy. Also in contention were their jerseys from the ’30s–’50s, but it’s hard to tell whether those could actually be considered black jerseys with all the red and white on them. 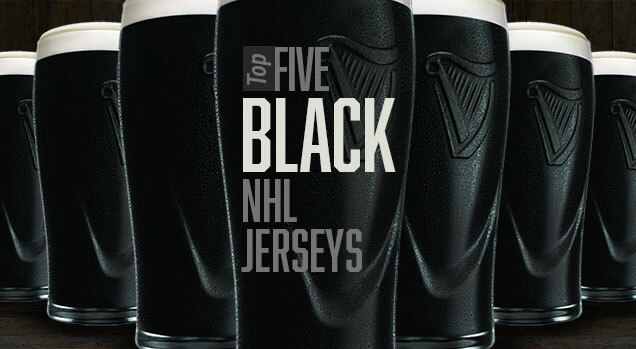 And now here’s the best black jersey (and only one on this list) to ever lift the Stanley Cup. Admittedly, I wasn’t a huge fan of these jerseys until the Penguins brought them back in 2014 initially as a third jersey and suddenly remembered how great they look on the ice. The generous amounts of gold on the sleeves – along with thick white stripes on the sleeves and the bottoms – brings some great energy and contrast to the black, lightening the whole jersey. And here, the black actually makes sense. Penguins are predominantly black, so sure, it works. 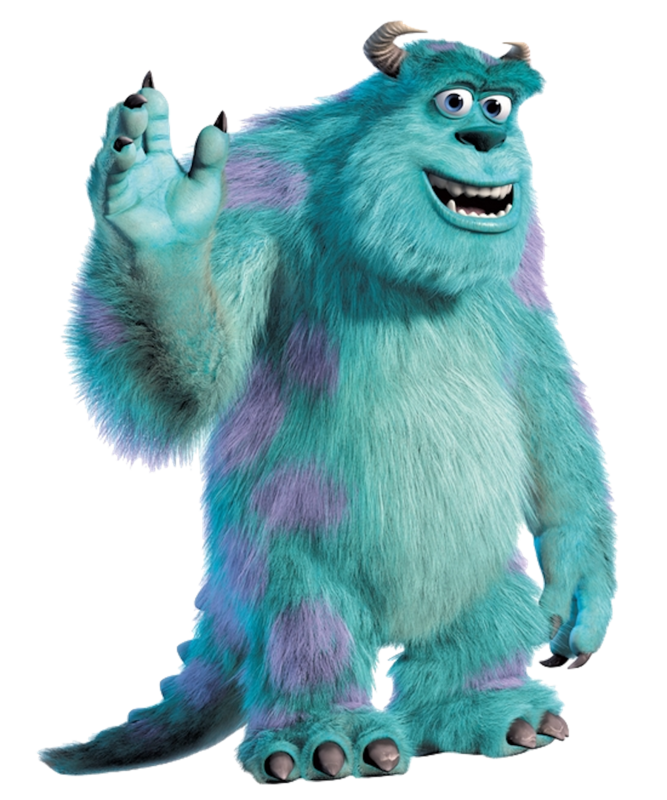 For the record, I still prefer those baby blues though. It’s no coincidence that another black/gold/white combo takes another high spot on this list. 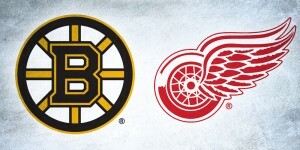 The colour palette is very strong, aggressive, and energetic…and nobody pulls it off better than the Bruins, specifically their latest iteration of it, with the gold and white shoulder yokes and stripes framing what is one of the best logos in the league. The striping on the sleeves and jersey bottoms are classic and consistent, and among the best examples of classic jersey design out there. Balanced, visually impactful, and full of intensity, these jerseys are among the best in the league…black or otherwise. So with all that praise, what could possibly beat it? 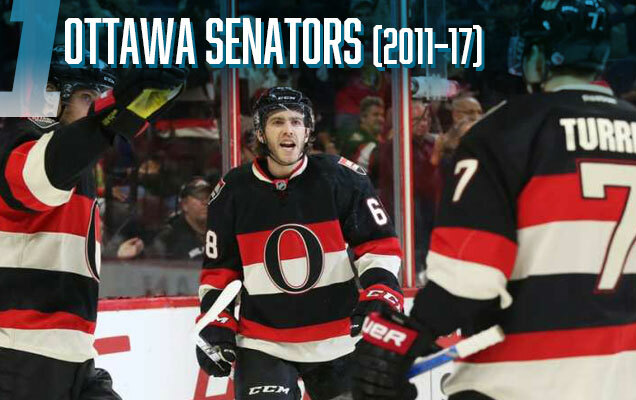 The Senators takes the top spot with their most recent third jersey (which will hopefully make a comeback as soon as next season). It bests the Bruins – and all the rest of the jerseys on this list – because it’s such a great balance between classic and contemporary, simplicity and complexity, familiarity and uniqueness. The boldness of the red and off-white double chest stripe, along with the matching stripes on the bottom of the jersey, add the contrast that a black jersey needs a good amount of to work. And the combo of black-red-white is among the strongest and impactful colour combos you can have. Ottawa, these fantastic jerseys are sitting right in front of you, get rid of what you currently wear as soon as possible please. How you must have hated writing this post, with your dislike of black jerseys. I actually agreee with almost everything you said here. I thought the early 2000s Vegas gold pens would be on this list, but the present Pittsburgh set deserves a mention as well. 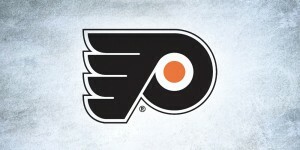 But I respect the city of Pittsburgh for going back to a visually cohesive branding throughout all it’s sports teams. That is, until the Steelers pull out their bumblebees, which they are thankfully getting rid of them this offseason. Haha, yeah, it was a bit painful, but there are some good black jerseys out there. 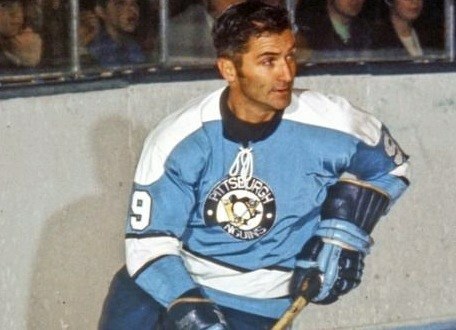 I did consider the Pens Vegas gold jerseys, but over time, I’ve grown to like their current versions better. Hm, nope. I don’t enjoy them, but I will argue about whether the Pens or Bruins have better black jerseys. But the Senators? They’re good. But the Bruins jerseys are synonymous with “hockey jersey”. 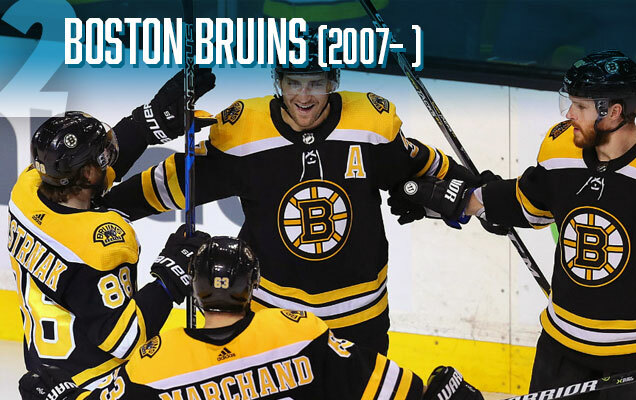 The stripes, the shoulder yokes, the spoked B… the Bruins own black hockey jerseys. Everyone else just rents.